Delicious and velvety Greek Yoghurt was combined with whipped cream and pomegranate juice to make this mousse with a very light and airy texture. In my previous post where I made Greek yoghurt for the first time, I told you that the first time I made it, it did not set as it should and it looked more like a cream rather than a yoghurt. It still tasted like yoghurt but what was I supposed to do with it? Some ideas swirled in my mind and I started of thinking of ways to use it. I could use it instead of milk and use corn starch to make a cream or I could use gelatin. I preferred the second idea. I love desserts with gelatin as they are so light so I started thinking of ways to use it. I looked in the refrigerator and I had pomegranate juice so this would be the base of my dessert. The remaining ingredients were added in the course of making the dessert. I added the grenadine for more colour and I used the whipped cream to make it more creamy. Looking in my pantry I saw the mixed fruit and that would also add to the taste as well. If I were to change something to this dessert, instead of adding the mixed fruit, I would add a Cherry compote the next time just because it would look better. Normally I would have added all the fruit syrup but I didn’t have enough gelatin, so I just added one cup. I would also substitute the Pomegranate juice with Homemade Pomegranate Syrup, which at the time I did not have. You can adjust the liquid ingredients so for every litre of liquid you will need 12 sheets of gelatin or 2 sachets equivalent to 2 tablespoons (20 grams) gelatin powder. I did not add much sugar as the pomegranate juice, the grenadine and fruit syrup were already sweet, so this is up to you to taste and adjust. I do not have any pictures of the preparation procedure because actually when making it I didn’t expect that it would turn out to be such a wonderful dessert, worth of posting but it turned out to have all the components of a delicious dessert. It was beautiful in appearance and colour, it was creamy and fluffy and packed with flavour and yet so light and not sweet at all. I served it with an Eggplant spoon sweet which was made with grenadine, so the flavours matched perfectly but you can serve it with Cherry spoon sweet, or Sour Cherries spoon sweet or Cherry compote, or with other Red fruit spreads and sauces on top, such as strawberries, raspberries, plums, cranberries etc. During the summer if you freeze it you will have a lovely sorbert. Soak the gelatin with 1 cup of water. Drain the fruit, reserving the syrup. Heat the pomegranate juice and fruit syrup until lukewarm and then mix in the gelatin. Mix in the grenadine and set aside to cool. Refrigerate for about an hour until it begins to set. Beat the whipped cream with the vanilla and sugar and then add the yoghurt. Refrigerate until the pomegranate is ready. Return the pomegranate to the mixer bowl and beat for about 5 minutes on high speed. Reduce speed to medium and add the whipped cream until combined. Mix in the fruit with a spatula and freeze for a few hours before serving. Ivy, the mousse looks so creamy, smooth, light yet flavourful! A fabulous mousse! What gorgeous flavors! 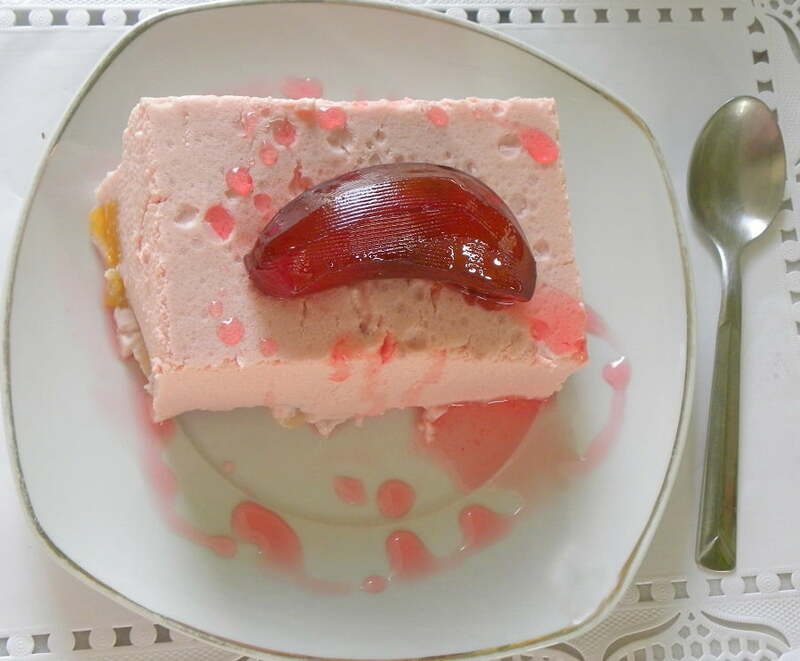 I love this dessert, light and flavorful with the unusual taste of grenadine. I have an award for you on my blog today. Congrats! Quelle couleur et quelle texture, superbe ! Ivy mon amie, ton dessert est vraiment magnifique. Oh my word Ivy this looks so light and delicious! You have a fantastic creative mind! Ivy, I am sure I wouldn't know what to do with it, other than throw it away. You are so creative making such a lovely dessert out of a failure. oh,pink is my favourite!lovely colour,gorgeous recipe! What a stunning and beutiful dessert! And in my favourite colour – pink. O Wow wow woow how very colourful and festive … like a light whif of summer in the winter … pomegranate one of my fav fruits … and cheescake like desserts I love too … so yes I will making, atteppt to make this this weekend! I bet this is absolutely delicious with your homemade yogurt! I really love pomegranates. A wonderful seasonal dessert where you could apply other fruits, depending on the time of year.